Make a steakhouse classic at home, with our simple grilled steak recipe. Topped with savoury onions and mushrooms, this grilled steak is sure to become a family favourite. 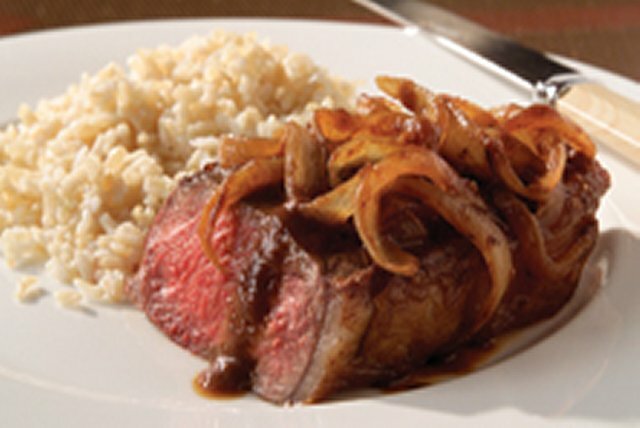 Our Steak with Brandied Onion-Mushroom Sauce recipe is a must-try! Grill steaks 14 min. or until medium doneness (160ºF), turning after 7 min. and brushing with 1/4 cup of the barbecue sauce. Meanwhile, melt butter in large skillet on medium-high heat. Add vegetables; cook and stir 2 to 3 min. or until tender. Stir in brandy and remaining barbecue sauce; simmer on low heat 5 min. or until heated through, stirring occasionally. Serve steaks topped with barbecue sauce mixture. Round out the meal with a tossed green salad. Cool, then refrigerate any leftover steak and barbecue sauce mixture. Cut steak into thin slices. Serve in partially split 6-inch Italian rolls topped with the warmed barbecue sauce mixture. Prepare as directed, omitting the brandy.